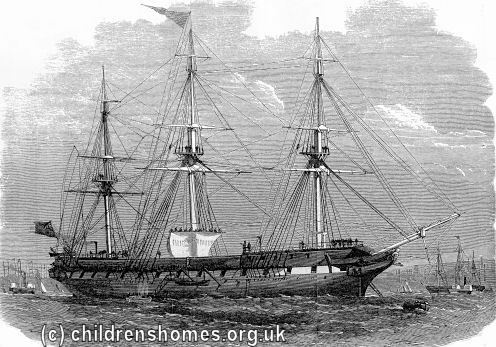 In 1864, Liverpool seaman and ship-owner John Clint founded a charitable institution to provide naval training 'for the sons and orphans of sailors who are without means, preference being given to those whose fathers had been connected with the Port of Liverpool'. The following years, the scheme became a reality when the Indefatigable was loaned by the Admiralty and moored on the River Mersey at New Ferry, Birkenhead. Mr James Bibby contributed £5,000 to transform her from a fighting ship into a training ship, and this was to be the start of a long association between the Bibby family and the school. 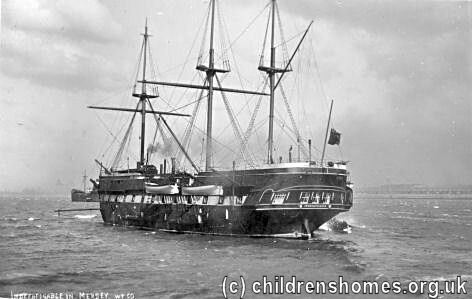 The ship had accommodation for 250 boys aged from 12 to 15 years who were required to be 'of good character'. The payment required was £22 per annum, and £5 10s. for outfit on discharge, and boys of all religious denominations were received. 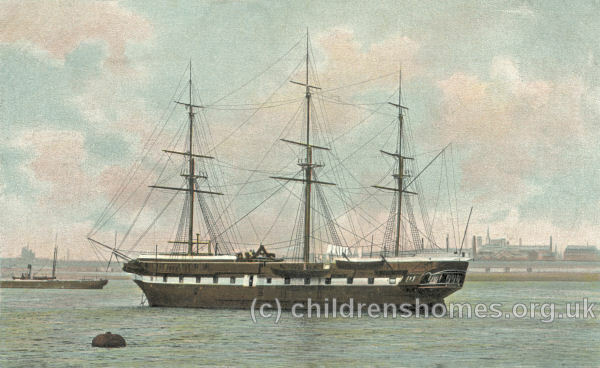 A sailing tender was attached to the ship, and a hostel was established for boys returning from sea. 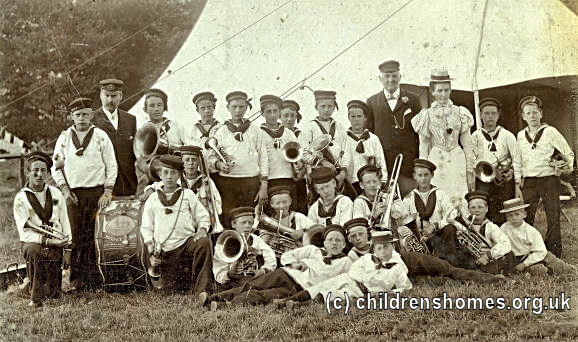 By 1911, 5,000 boys had passed through the ship, of whom 4,500 had been sent to sea. The Captain Superintendent was then Commander Henry Butterworth, R.N. 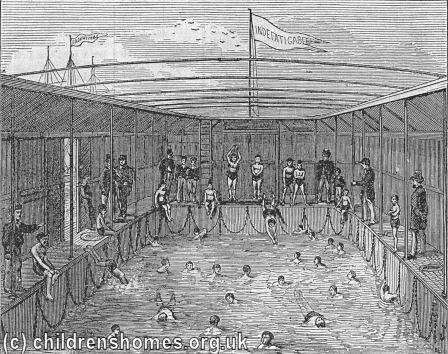 In 1874, the ship acquired a floating bath in which the boys learnt to swim in safety. It was designed by W. R. M'Kaig, engineer, and J. Carlton Stiff, and made at the Windsor Ironworks, Garston. It was an iron cellular structure, the pontoons or compartments of which enclosed a space 50 ft. long by 20 ft. broad, which formed the water area. The depth at the shallow end was 3ft. 6in., but the deep end could be varied from 3ft. 6in. to 6ft. 6in., by means of an adjustable bottom or tray, hinged at one end and supported by chains at the other. The lifting power was supplied by two small worm-wheel and pinion apparatus. The bath, which was open to the sky, was moored at one end and swung with the tide. The water entered at the deep end and passed out at the shallow end. In 1912, the ship was deemed unfit for further use. As a replacement, in 1913 the Admiralty provided HMS Phaeton which was renamed the Indefatigable until 1941. The war then forced the establishment onto land, first at temporary accommodation in North Wales, and later in 1944 at Plas Llanfair, Anglesey. In 1945, the ship amalgamated with the Lancashire National Sea Training Homes and renamed The Indefatigable and National Sea Training School for Boys. Many of the boys trained on the Indefatigable went on to have long and successful careers in the Merchant or Royal Navy.